Who’s looking out my window? With a consistent 9 to 10 views a day since I put it up at the beginning of the month, this photo is currently one the most popular on my flickr stream. But who is looking at it? 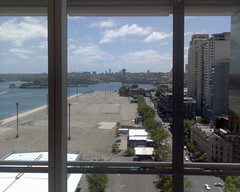 It is a nice view of the wharf out the window of the KPMG building in Sydney. Taken to see what the area of the proposed water front redevelopment looks like now. With around 430 views, and all but 2 of them listed as ‘Unknown Source‘ in flickr stats, ie no refers. It has left me wondering who or what is so interested in this photo? What is the big secret? I presume that the ‘Unknown Source‘ means that it is being referenced to on some intranet page, with the referrer being blocked by a proxy. That or someone keeps reloading the image in a client program. Any ideas? Are you my mystery photo viewer? This entry was posted in Photos and tagged KPMG, photo, water, window. Bookmark the permalink.